This was a ‘must win’ game for Reeds to keep their promotion hopes on track, but they knew it was going to be a stern examination as OW’s have already clocked up wins against Haileyburians and Cranleigh, two of the top sides in the league together with a win against a formidable Kingston outfit. With a mighty set of forwards the OW’s game plan was to keep the ball tight, shunt Reeds pack around in the scrums and attack on the fringes, and it worked. Reeds conceded penalties along with territory and it was full back Charlie Gordon who dummied his way over the line for the first score, the relatively easy conversion went wide, the importance of having a reliable place kicker subsequently proved to be a crucial aspect of the game. There were some ferocious exchanges in the loose rucks and mauls and Reeds have a back row of Alex and George Corner together with young Will Ambidge who were so effective in shutting down the OW’s progress and turning over possession, when that happened Reeds were at their best. Pete Davidge, the Reeds fly half knew that quality possession was going to be in short supply and that Reeds out wide were a serious threat, a huge spiralling pass found centre Johnny Rogers and his inch perfect pass to full back Chris Stegmann put the youngster away, he is such an imperious runner with the confidence to take on the defence infield or on the outside, he brushed off a couple of tackles and was try line bound for Davidge to knock over the conversion. In monster games like this it is so important to rack up the points when they are on offer and Reeds extended the lead with a long range penalty from Pete Davidge. Chris Stegmann collected his second try of the day to put Reeds five points ahead, but then matters began to unravel for Reeds, they lost two men to the bin together with an injured man from the front row that resulted in uncontested scrums which in turn meant Reeds had to lose another player, they were down to twelve men on the park for a short while. Good sides are not measured by their performance when all is going well but by their reaction to adversity, and Reeds skipper Billy Maddock is the man you want to have running the show when the chips are down, his outstanding leadership in the most difficult circumstances earned him the Man of the Match award. 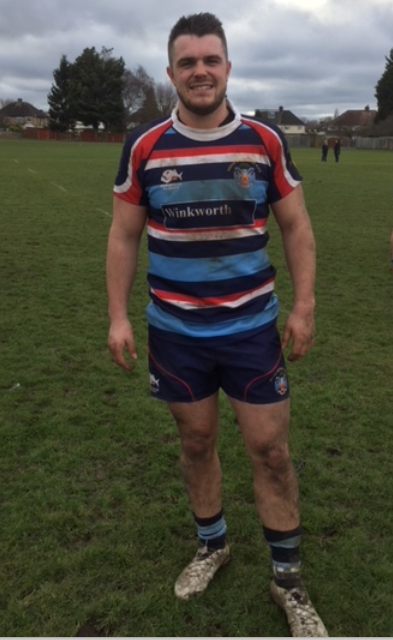 But with a three man advantage OW’s saw the opportunity to collect points, there were two quick tries for the hosts, the first when Cameron Brown the big centre went bursting through, then Ben Rose the winger chipped the ball over the defence and won the race for the line. At the change round OW’s had twenty six points on the board and Reeds were nine points adrift with a slight slope and breeze against them. Reeds two men were back from the bin but played the whole of the second half with fourteen men and uncontested scrums. Reeds started the 3rd quarter on the front foot and went through wave after wave of plays moving the large OW side around. Pete Davidge clawed back another three points with a long range penalty but Reeds needed another converted try to lead. It came from the magical running of Dan Veale, Reeds young winger, bewildering sidesteps and a huge surge of pace took him close to the sticks for Davidge to bang over the conversion for a one point lead. But that was just the beginning of the drama, with a quarter of the game left to play OW’s realised that with a one man advantage they could stretch the Reeds defence and they did, Ben Rose the OW’s winger thought he had scored but a huge tackle from skipper Billy Maddock held him up over the line. Reeds were pinned down in defence as OW’s tried to kick the door down, but Reeds have an ‘Iron Dome’ defence, especially around the fringes and OW’s finally decided to use the open spaces, Ben Rose thought he had scored the winning try but somehow Reeds managed to knock him down inches from the line. The scrummage that followed was the last play, Reeds knew that the drop goal attempt was coming, fly half Liam Gwynne lined up the kick, it was bang on target until the last moment when the stiff breeze blew it just wide of the sticks. Perhaps, if OW’s had used the open spaces more frequently to exploit their one man advantage they might have won the day but equally Reeds determined resistance against all the odds just nudged them home. Reeds have to fulfil a postponed home fixture against Purley John Fisher, it is scheduled for next Saturday at Whiteley Village but not confirmed at this stage. Skipper Billy Maddock for outstanding leadership in the most difficult of circumstances.